Hi everyone it’s Lisa here. Today I would like to share with you a 12×12 layout based on a beautiful photo I found on the internet. 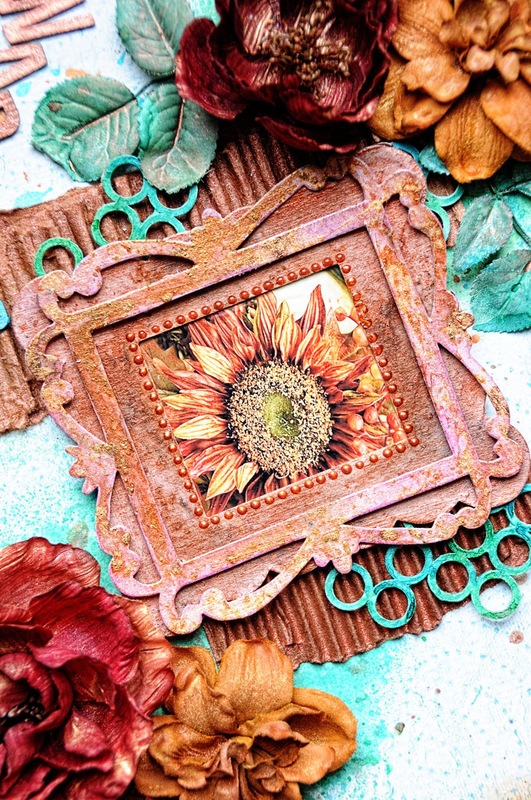 Just a simple sunflower evoked all of the creativity I used for this layout. I started with a paper from 7 Dots Studios using the 9th Wave Collection. For all of my colors, I used Lindy’s Autumn Leaves Starburst Spray Set. It contains the following colors. They are all rich and velvety in color! Autumn Maple Crimson- a beautiful, rich crimson (burgundy) color with a soft red shimmer. Cattail Copper Brown- a rich, coppery brown with a copper shimmer. Ponderosa Pine Olive- a deep rich green colors with a subtle olive hue. Tibetan Poppy Teal- a rich and vibrant teal color, with a deep turquoise/teal shimmer. The flowers were purchased at Hobby Lobby. I stripped them from their plastic stems, along with the leaves. 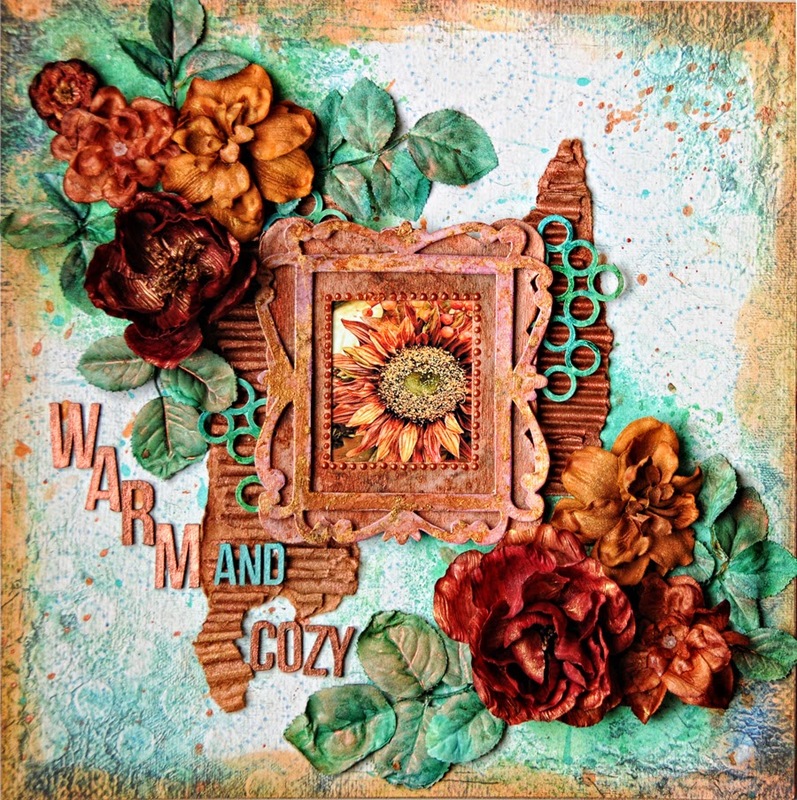 For the leaves, I used technique that I learned from my very talented friend Lynne Woolgar that she did for Lindy’s last year. Click her name for details. I used the Olive and the Teal for the leaves. I used a splash of the Copper Brown on them as well. 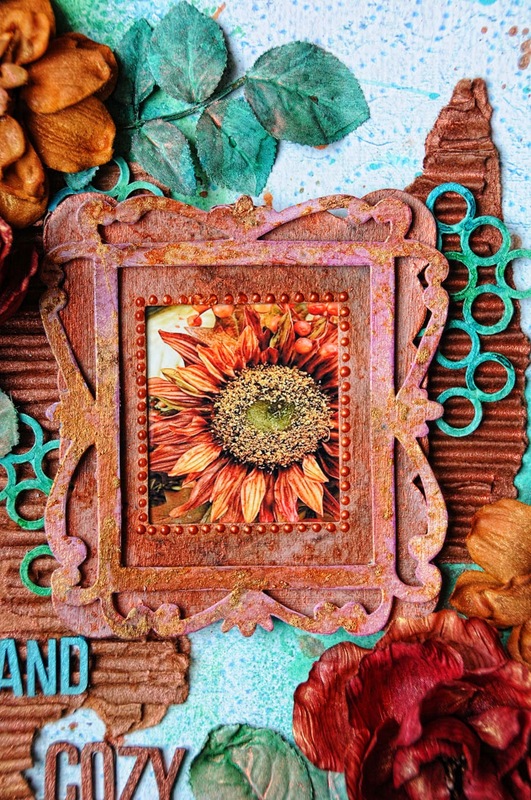 The frame is a combination of 2 different Sizzix Frame dies. I just layered them. I primed them with white gesso, then sprayed them with the Copper Brown and Red Hot Poker Orange, then I stippled on some embossing ink onto the frame, and splashed on some Lindy’s King Midas Gold embossing powder, then heat set it. I sprayed some ripped corrugated cardboard using couple of layers of Cattail Copper Brown. I used a copper pearl pen to outline the inner frame. The Blue Fern Studios Chipboard Mini Ring Things was primed with gesso, then sprayed with Olive and Teal. My flowers were sprayed with the warmer colors of the set. The gold undertones they leave are simply stunning. I cut apart Blue Fern Studios Framed Winter Words set and treated it the same as I did with the Ring Things. Using my finger dipped in the Copper Brown, I rubbed it into the edges of the layout. Then flicked on some additional color. Just another angle of the frame. Both Sizzix dies have been discontinued and I m on the hunt for them both. Vintage Sizzix!! I had die cut these at a retreat last year.I may have to book another retreat just to cut some more!! Thank you for stopping by and letting me share my Lindy’s Stamp Gang Creation. I am honored that they chose me for their Seasonal Design Team. Their products are simply amazing!! Now onto some summer colors!!! Love how vibrant all the colors are. You rock color Lisa! Beautiful warm vibrant colours, warming me in winter down under! Beautiful warm colors! great project Lisa! Love this project, colours are amazing !